Fibromyalgia Awareness | Information, Tips, Support, Patient Stories: "But you don't look sick!" 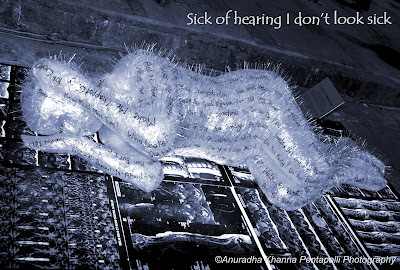 One of the worst parts of being a Fibromyalgia patient is the repeated and piercing sound of the cruel words, "But you don't look sick!" 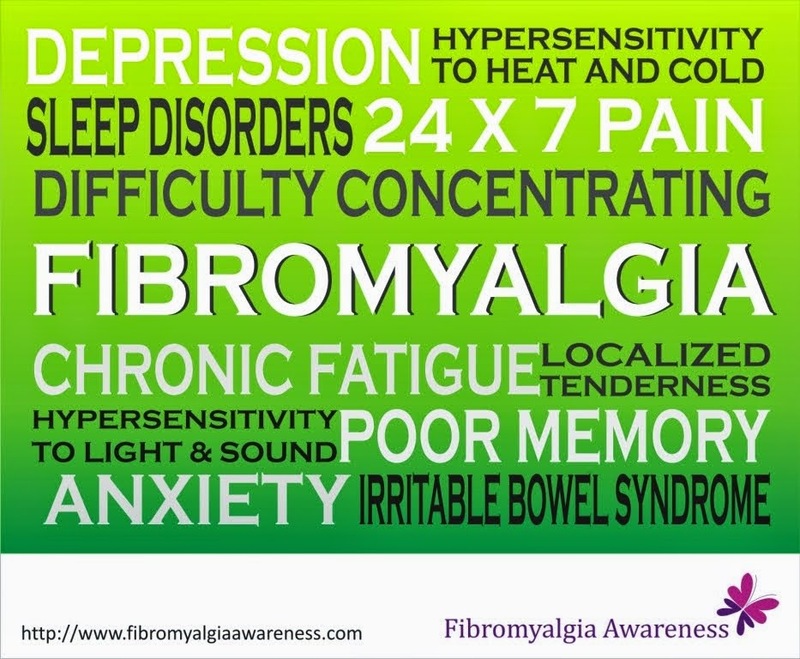 The fact is that while Fibromyalgia patients do not 'look' sick, they experience excruciating pain every single moment of the day... yes you read it right - every single moment. It has been around three years or more now, but I haven't had a single painless day. I haven't seen a book or a picture or a video in my life that shows what pain looks like! How often I feel that I would have rather had cancer or a deformity (okay God, please ignore this!). Not that I think that these are easy to deal with, I have lost many dear ones to cancer including my grandfather who loved me the most, but the thing is that at least people understand how serious these conditions are. And trust me, it matters a lot to the patient, however emotionally strong the person might be. But Fibromyalgia? The name is generally unheard of... even I had not heard of it until I was diagnosed with the condition. Once I took a few days leave from work as I could not sit / stand / type for even 15 minutes at a time. The pain and the inflammation is impossible to describe. I returned to work as early as possible only to hear one of my seniors say, "You don't look sick!" Hello!!! If you'd have asked what had happened to me, I would have told you. But most humans have this tendency to jump to conclusions... can't help this syndrome either. How on earth do you look sick when a condition has something to do with your CNS? When you have difficulty going to sleep... When the side you eventually manage to sleep on hurts all the while you are lying down... When you cry with pain for hours before you fall asleep... When you wake up but can't get out of the bed due to tremendous stiffness and pain... When you struggle to brush your teeth in the morning and find it difficult to filter tea as your hands are unable to hold things properly... When you must take a hot water shower but standing is too painful in the morning... When you sit to work but can't sit continuously, so you stand up, but your feet hurt, so you walk around but your knees hurt... When you have high fever for months together and your condition is taken for granted... When you can't even lift your handbag... When you can't even hold a little baby... When you can't manage your daily chores... When you can't eat the things you feel like having... When you experience hair fall... When you suddenly become super sensitive to light and sound... When you experience unnecessary fatigue... When you forget the smallest of things... When you feel millions of pins hitting you all over the body, all the time... and you try to put on a nice face, not for anyone else but just so that you try to convince yourself that it shall be fine... When you know it won't be... How on earth do you look sick??? People, FIBROMYALGIA PATIENTS DO NOT LOOK SICK and we do not have time or energy to try and look sick. We just manage to do as many chores in a day, more than what our body allows. Just trust a Fibromyalgia person when he / she complains of pain or understand the person even when there's no complaining, coz the pain is always there. REMEMBER: FIBROMYALGIA PATIENTS ARE NOT LAZY. I am so glad I stumbled upon this essay! I hear that I don't look sick all the time from my partner and coworkers. I feel like they resent me and think I am lazy and faking it. I struggle daily and feel so alone . I am going to pass this on to my partner in hope that it will give her insight! Thank you! Thank you. I am glad this post could be of help. I hope your partners and coworkers understand what you go through and take you seriously. Take care and do let me know if there's something else you think I should talk about in this blog. For years Fibromyalgia has made my family think I am faking illnesses so I want to thank you for this essay. I am going to share it with my mother whom is not very supportive. This is 2013, I think it's time science studies more into this terrible medical problem. WE SUFFERS NEED HELP and recognition for what we go through. Doctors should get the word out to family's of fibromyalgia patients. You are so right. I am happy this can be of help to you. See you around! Take care. THANK YOU FOR THIS ESSAY! It describes my FMS to the T.
It showed me that someone else, multiple someones, understand. I am 15 (almost) and living with FMS, among other things. It is such a large part of my life, yet so few understand or even realize.I can't tell you the number of times I have wished to have cancer, diabetes, or anythings else, just so others could understand and take is seriously. I hate hearing "But you don't look sick! ", or "You just need more exercise/better diet..." Their are so many days when I just want to cry my eyes out, and scream to the world about the pain I feel, but I don't. I can't. Their are too many people who expect more, need me to be more. Most people just judge and criticize, but I am glad that someone understands. I hope the fact that I am glad that their is someone else with FMS doesn't make me a bad person. But I am glad never the less. Thank you so much for the comment Katie. I can truly understand what you go through. But don't give up ever, we all are in this together and we are always there to hear you out. Have you joined our facebook page? We are online almost all the time and you can get a lot of support, friends and tips there. Take care!